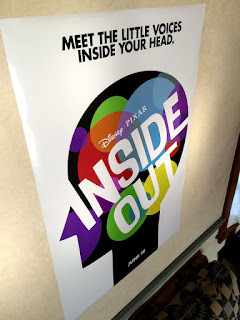 On October 2nd, 2014, Pixar released their very first teaser poster for Inside Out. The poster started off as an awesome online "motion poster" with music and was featured on a very early official site for the film. It was then also available as a high-res still image and a tangible movie poster print (size 27" X 40") soon after that (with the tagline "Meet the Little Voices Inside Your Head." and the June 19th release date). I've always been a fan of the poster's simple, minimalistic design and always figured I'd purchase it at some point. For my recent Inside Out themed birthday (see my full post HERE), my wife surprise me with it (doubling as a decoration and a present)! I'm thrilled to have it as part of my collection and plan on giving it a nice frame and presentation one day in my Pixar man cave. If you're interested in snagging this poster for your collection, be sure to visit eBay or Amazon (among many other sites) to purchase.